The anterior cruciate ligament (ACL) is one of two ligaments that connect the thigh (femur) and the shin (tibia) bones. The ligament gives support to the knee joint by holding these two bones together and stabilizes movement. When the ACL is torn, this stability is lost and surgery or at minimum, therapy, is needed. 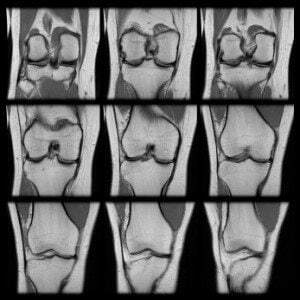 ACL rarely only partially tear. Most torn ACL have a complete tear of the ligament. The signs of a torn ACL will be immediate. There will usually be a "popping" sound when the ligament tears followed by pain, swelling and loss of stability. Most torn ACL tears are seen for medical attention right after the injury occurs. To diagnosis a torn ACL, the physician will perform a physical exam, testing the radius of movement and looking at the structural make up of the knee. Most ACL tears can be diagnosed through a physical examination alone but an MRI can be done to confirm the damage and X-rays may be done to rule out broken bones. Therapy is almost always needed with a torn ACL. This is either by itself or after surgery. The ACL will not heal on its own without surgery but some patients, usual elderly, opt to not have surgery and go the therapy route. Therapy without surgery means the patients will need to agree to limiting their activities for several weeks or months, use a brace and have physical therapy to build strength in the muscles supporting the knee. Torn ACL cannot be sutured back together so the ligament needs to be reconstructed through surgery. A tendon graft is performed, using tendons from the patient's knee, quadriceps or possibly the hamstring. This addition of tendon replaces the ligament and gives the new ligament something to build upon. After surgery, there will be needed physical therapy to increase strength the surrounding muscles and to bring back range of motion movements. The patient will need to use crutches and possibly a knee brace following surgery. A small percentage of patients have complications after an ACL surgery. There is possibility of infection, bleeding, numbness, blood clots and issues with the tendon graft. Most patients recover the full use of the knee in 4-6 months. ACL tears and other types of knee injuries are commonly sustained by people due to: car accidents, bicycle crashes, falls, work injuries or other trauma. Our attorneys have helped many clients with these type of injures recover maximum compensation from the at fault party. Many ACL injury cases result in considerable recovery for our clients after damages are asserted for: medical expenses, pain, disability and lost wages. If you suffered an ACL injury in an accident contact our Illinois personal injury law firm for a free legal consultation. As with all of our cases, our services are free if we can not recover for you.